The Dishonored Skald is a Nord warrior who may appear in the Bards College in Solitude during the quest The Dark Brotherhood Forever. He will only be enabled if the Night Mother picks him as the contract giver. 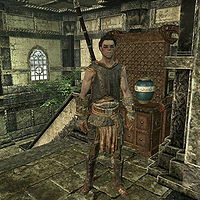 He wears a set of iron armor, including the gauntlets and boots. He also wields an iron warhammer and carries a copy of A Kiss, Sweet Mother. This page was last modified on 22 December 2017, at 02:30.